1. Scene of two battles in which the Israelites were defeated by the Philistines. In the first engagement they lost 4,000 men. The Ark of the Covenant was then fetched from Shiloh, in the hope that its presence might bring victory to the Israelites; but in a second battle they lost 30,000 men. The Ark was captured, and Hophni and Phineas, the sons of Eli, were killed (I Sam. iv. 1-11).The exact site of Eben-ezer has not been determined. It was near Aphek, and near enough to Shiloh for a man who had been in the second battle to reach Shiloh the same day that it was fought (see G. A. Smith, "Historical Geography," p. 223, note). 2. 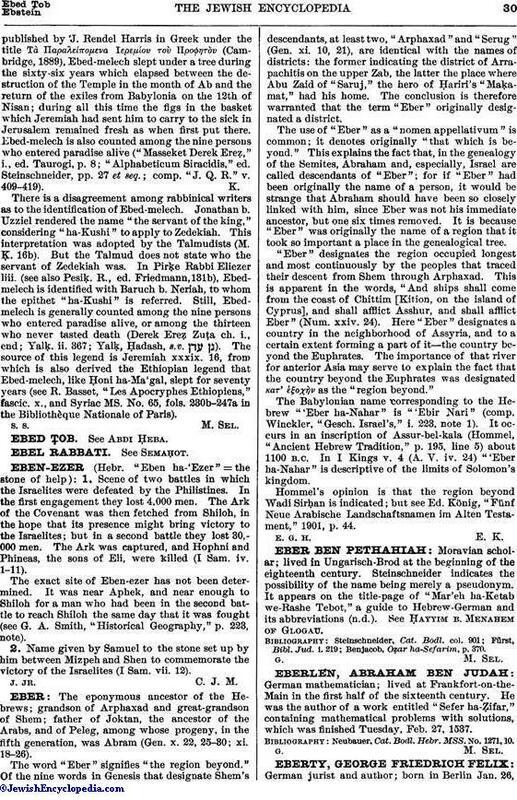 Name given by Samuel to the stone set up by him between Mizpeh and Shen to commemorate the victory of the Israelites (I Sam. vii. 12). J. Jr. C. J. M.